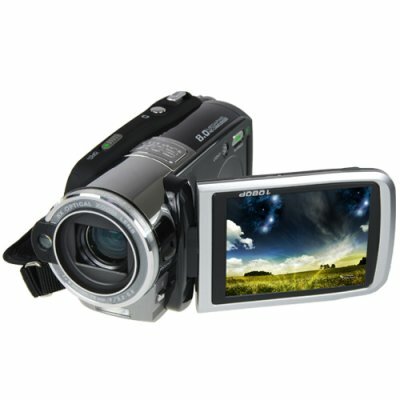 Successfully Added 1080P HD Video Camera - High-Res Video Camcorder (Up To 60FPS) to your Shopping Cart. HD Digital Videocamera with native resolution up to 1080P and still image capture at up to 8 megapixels. This is our new heavyweight HD video camcorder. With the ability to take H.264 video (MOV) at up to 60 frames per second (60 FPS) and a professional grade lens + image sensor, this model will make you want to quit your job and become a Hollywood movie director! With a high definition (HD) recording the video fills the entire screen with vibrant, clear imagery that must be seen to be believed. This digital video camera can show you what HD is all about! Not sure if you can handle a new camcorder? No worries! Recording your shots with this beauty is extremely simple - from the easy to use button layout and the beautiful 3" viewing screen, to the on-the-fly expandability with SD memory cards and standard NP-120 batteries, everything has been designed with maximum end user ease and convenience in mind. The 1080P HD video camera works great as both a video and still picture camera and comes as a kit with just about everything you need to get started; Camcorder, camera bag, battery, charger, software, and all required cables included. You just need to add your own SD memory card (up to 8 GB's) and you are ready to start shooting in HD brilliance. This is a great HD digital videocamera at an even better wholesale price and is available with Chinavasion's famous 12- month warranty. Available right now with direct shipping. on 2010-07-11 16:45:15 Great product. Delivery was less than a week. Google it and you will get a download. Finally i got one and am just fine. I am really impressed and i need not to worry when an occasion comes up.I will cover it like a pro.jajajaja.